#DerikLattig says wow! Astronomers have identified the smallest star ever discovered in the Universe and said that it could help in the search for Earth-like planets that may have the potential for life. 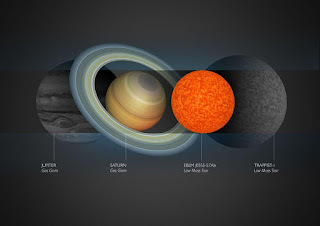 The star is located 600 light years away and is just larger than Saturn, according to researchers at the University of Cambridge in the U.K. The radius of Saturn is around 9.5 times that of Earth, but stars are generally much larger than planets. Named EBLM J0555-57Ab, the newly-identified star has a gravitational pull around 300 times stronger than that on Earth. Its radius is 8.4 percent and mass 8.1 percent the size of that of the Sun. Hey Derik Lattig this is cool!